Putting money where the mouth is, the value of Russian artworks has reached a record high this month at auctions of Christie’s, Sotheby’s and MacDougall’s. Bad mouthing by the US State Department daily briefer is cheaper, as the US Government endorses Ukrainian government hate speech in referring to Russians in general as “subhuman”, and the president in particular as a “dickhead”. But for the heads of the Russian art departments at Christie’s and Sotheby’s, neither US sanctions nor the Russophobia of the London press have made any impact on cultural sentiment. If anything, Russian art buyers are bidding against each other to recover and return to Russia works which have been on the walls of American and European collectors who acquired them before the revolution, or in the fire sales just after. Not exactly for patriotic reasons, Russian art buyers are doing this because they are confident the London market is securing new asset value, ensuring that even in the short run, Russian art will enjoy a lucrative resale price. According to William MacDougall, who directs a London auction house specializing in Russian art, “confidence has returned to the market after the worries about Ukraine and sanctions of the last few months, while top lots continue to do well in Russian auctions”. MacDougall’s is the only London auction house to specialise solely in Russian art. With a 25% share of that market internationally, MacDougall’s also has representative offices in Moscow and Kiev. MacDougall’s auction of more than six hundred pieces on June 4 fetched £10.3 million. The most sought-after paintings were pre-revolutionary. One, a 1910 canvass, “Boy with Cap” by Robert Falk, left Russia with an anonymous European collector, who got it from a Leningrad family sometime after World War II. It sold within the estimated valuation range for £1.04 million ($1.7 million). The top lot at MacDougall’s was Pavel Kuznetsov’s view of Bukhara. Painted in 1912, it left Moscow for a European owner in 1956. The painting fetched £2.4 million ($4 million), also within the pre-sale estimate. Christie’s and Sotheby’s dominate the remainder of the Russian art market, with Christie’s claiming in the wake of the June sales that it holds the largest market share for Russian art traded internationally. Christie’s reports that its June 2 auction realized sales of 234 of the 302 lots on offer, for a total value of £24,012,200 ($40,196,423), including the buyer’s premium. 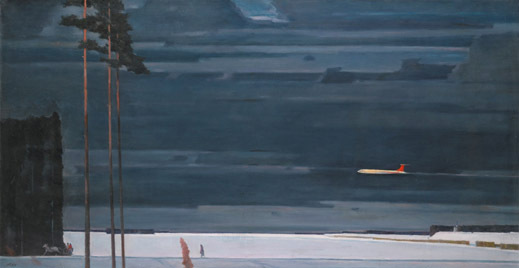 For the first time, Sotheby’s offered a group of Soviet-era paintings held by the Russian Union of Artists. According to Asquith, there were 22 lots, which were estimated at £3.5 million. Although the sales fell short at £2.34 million, Georgy Nissky’s ‘Over The Snowy Fields’ (below) set a new auction record for Soviet painting — £1.8 million ($3 million) – more than double Sotheby’s estimated valuation between £500,000 and £700,000. For the time being, all the art houses agree, the driver of price is rarity. That means that Russian painters of the late 18th and early 19th centuries, from whom supply is most limited, generate the most competition among buyers, and thus the highest prices. Wealthy Russian collectors, who have already amassed as much porcelain and jewellery as they want, are moving on to a new class of what the market is calling “trophy art”. “They are looking for the best in the category,” Mansfield says – “the truly great pieces”. Supply is scarcest for some 19th century painters; even rarer still are the avant-garde painters of the decade before the revolution. Two paintings by Vladimir Borovikovsky (right), who came from a Ukrainian Cossack family and worked between 1780 and 1825, were sold for record prices well above earlier market valuations. The portrait of Countess Kusheleva (lead image, left) had been estimated at £70,000; it went for £3 million. A second painting, a portrait of Prince Petr Lopukhin, fetched £2.2 million; the pre-auction estimate was £60,000. Three other portraits of Kushelev or Lopukhin family members by Borovikovsky sold for a total of £2.8 million. 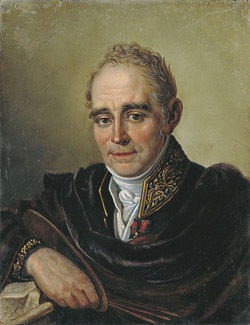 Borovikovsky’s reputation as a portrait painter was established in the St. Petersburg aristocracy, and reportedly 400 of his portraits have survived. Whether the price will drop as more of them appear on the market remains to be seen. For the time being, the rarity has generated intense competition among buyers. 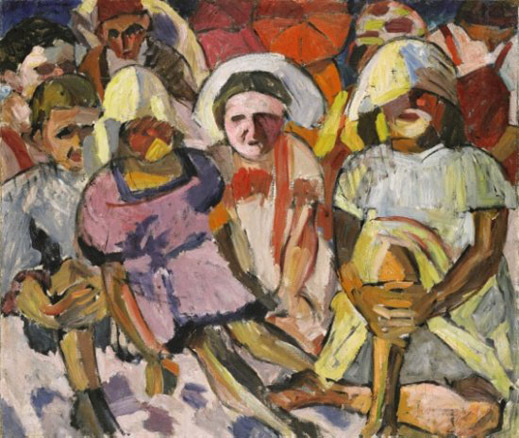 Sotheby’s top lot in this category was Aristarkh Lentulov’s ‘Children with Parasols’ (below). Painted in 1912, it went for £2.1 million, a record for the artist. In 1974 the same work was sold by Sotheby’s for £180. For the paintings which failed to sell, the art houses were asked to explain why. “In some cases,” MacDougall said, “the sellers were too ambitious in the reserve prices they were willing to agree to sell at. In some cases — for example Aivazovsky — there may have been too many works for the market to digest.” At Sotheby’s, Aivazovsky’s ‘Shipwreck off the Black Sea Coast’(below left), which had spent most of the 20th century in a Swedish family, managed to reach £1.7 million, below the top estimate. In 2006, Sotheby’s had sold the same painting to a European collector for £814,400. An Aivazovsky view of Odessa on a moonlit night, failed to sell. His ‘Sunset, Crimea’ of 1865 (right) was estimated at £90,000; it sold for £194,500. Most of the sellers of these works turn out to be Americans or Europeans (German, Dutch, French, Swiss), who came by their paintings from emigration or tours of duty at embassies in Moscow. One of the sellers in the Christie’s auction was the art gallery of Vassar College, in the US. It is selling Russian works which were originally paid for and donated by Frederick Thomson, founder of the bank which these days is Citibank. The Vassar trustees are swapping out of Russian into something else. According to Sotheby’s, about 40% of its works came from Russian sellers, 60% non-Russians. The auctioneers agree that there is growing market interest in Soviet art, but the taste for socialist realism “hasn’t really taken off yet,” says Mansfield of Christie’s. Part of the reason is the substantial supply which dampens trophy collectors and depresses the price. Another reason is that there is difficulty telling originals, artist repeats, copies, or fakes apart. In Tom Wolfe’s fictional scheme of lucrative and lethal Russian art forgery, it’s the pre-revolutionary avant-gardists, not the socialist realists, who are the targets worth faking. Even in that fictional secondary art market, when there is no confidence in the secondary or resale market, there can be no arbitrage, so too little bidding demand for too much supply.